Authorities believe more than 2,500 people have died from Saturday?s powerful earthquake in Nepal. FRESNO, Calif. (KFSN) -- Authorities believe more than 2,500 people have died from Saturday's powerful earthquake in Nepal. That includes at least three Americans who were climbing Mount Everest. New video shows several climbers running for safety as the shaking started. Moments later, an avalanche seems to swallow them in a cloud of snow and debris. Dozens of people are still trapped above base camp and say they are running out of food. Relief agencies from around the world are now rushing to help them and countless others affected by the quake. The United Nations says 14 international medical teams and more than a dozen search and rescue crews are on the way to the region right now. 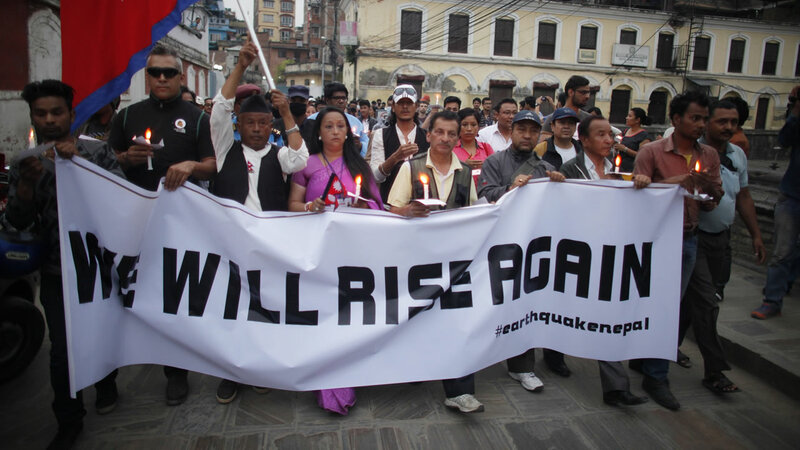 Tens of thousands of Nepalese are expecting the death toll to rise as the search for missing victims continues. One local doctor Action News spoke with is planning to leave for the devastated country to try and help. A look inside areas devastated by the powerful earthquake that struck Nepal on Saturday, April 25, 2015. Scenes of chaos and mass destruction from Nepal: 2,500 lives lost to a 7.8-magnitude earthquake just 50 miles from the capital. For Dr. Rais Vohra of Fresno, these images are hard to see. He was just in Nepal in 2013, training doctors on what to do when an earthquake hits. "It's really under resourced. They are usually at capacity at all of their public hospitals. They don't have a lot of what you would call medical luxury items to begin with, and this earthquake is really going to stress that medical system," said Dr. Vohra. He said in the coming weeks, relief organizations will start focusing their efforts from rescue mode, to making sure those who are still alive don't get sick. "There's a lot of displaced people who need shelter, they're going to need water, food, medicine, and they're going to be dislocated to places where they're extremely vulnerable to communicable diseases," said Dr. Vohra. Terrifying aftershocks are hampering rescue efforts, as well as landslides across the mountainous terrain. At least 18 people were killed in an earthquake-triggered avalanche on Mount Everest, in addition to the 2,500 that were killed in Nepal and neighboring countries. Many areas remain without power and water as overcrowded hospitals work to help the at least 5,900 who were injured. The American Red Cross said they've been flooded with calls of people wanting to help. "Some people want to get out there and volunteer and get on the next flight out, but we really recommend that people sign up to volunteer before a major disaster ever strikes; that way we can get you trained and already into our infrastructure and ready to go when there is a major disaster," said Red Cross Regional Director of Communications Jessica Piffero. She said the best way to assist is by donating money.